Never put off muffler or vehicle exhaust repair. The exhaust system in your vehicle ensures that toxic exhaust fumes stay out of your vehicle where you and your passengers sit. It also ensures that your engine is running correctly, and gives your vehicle the best possible fuel efficiency. A vibrating car may mean that your vehicle needs an exhaust inspection. A loss of power can often coincide with vibrations in your vehicle. If the vibration is coming from the steering wheel, the pedals, or even the seat, this could be the result of a hole, disconnected part, or a leak in the exhaust system. The vibrations are also signs that your engine may not be performing at optimum levels. If your catalytic converter begins to fail, you will hear loud sounds. A failing catalytic converter is very loud while your car is in idle. Your check engine light may also be illuminated. 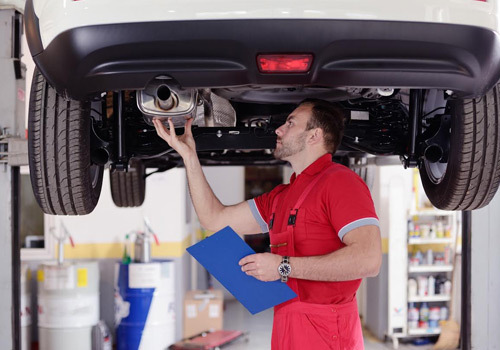 A deep rumbling sound coming from your exhaust pipe is an obvious sign that you have a muffler issue. This should be repaired immediately before more costly damage is done to your exhaust system. If your regular fill-ups aren’t getting you as far as they used to, your vehicle may need an exhaust or muffler inspection. Loss of fuel efficiency might be a sign of an exhaust system problem. Exhaust leaks make your car work harder, which requires more gas.